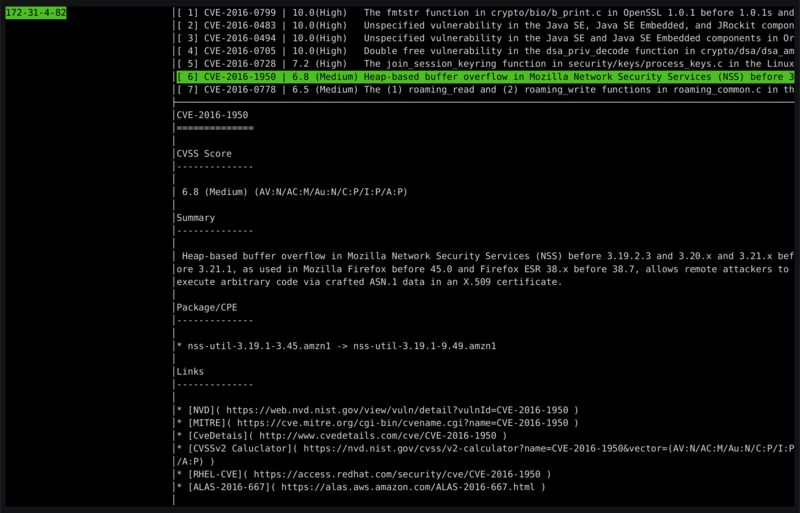 Vuls is open-source, agent-less vulnerability scanner based on information from NVD, OVAL, etc. Cloud, on-premise, Docker and supports major distributions. Vuls uses multiple vulnerability databases NVD, JVN, OVAL, RHSA/ALAS/ELSA/FreeBSD-SA and Changelog. Vuls v0.5.0 now possible to detect vulnerabilities that patches have not been published from distributors. Remote scan mode is required to only setup one machine that is connected to other scan target servers via SSH. If you don't want the central Vuls server to connect to each server by SSH, you can use Vuls in the Local Scan mode. Fast scan mode scans without root privilege, no internet access, almost no load on the scan target server. Deep scan mode scans in more detail. It is possible to acquire the state of the server executing some commands. Vuls v0.5.0 warns not-restarting-processes which updated before but not restarting yet. And detect processes affecting software update in advance. It is possible to detect vulnerabilities in non-OS packages, such as something you compiled by yourself, language libraries and frameworks, that have been registered in the CPE. Vuls has Terminal Based Viewer. You can view the scan result with vim-like keybindings.